After the conclusion of third day of the third test between India and Australia, it will not be wrong to say that the day belonged to the hosts as the efforts of the visitors were neutralized to a great effect with a brilliant opening stand between Dhawan and Murli Vijay. Except for the openers, Australian regular batsmen failed to perform again on the second day of the test. The day started with Steven Smith and Mitchell Starc on crease at 58 and 20 respectively. The team total at the start of the day was 273 for the loss of 7 wickets. The partnership between both non regular batsmen continued the partnership lasting for 97 runs. 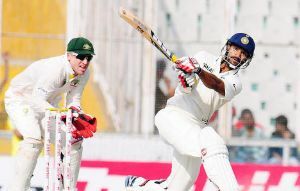 Smith scored 92 runs and was unable to convert it to a century as he was out stumped on a delivery by Ojha. Lyon did well to provide support to Starc as he continued scoring runs. He fell just a single short of his maiden test century that would have been the first one for a number 9 Australian since Ray Lindwall in 1946-47. He was removed by Ishant Sharma. Australia managed to score 408 runs from a position where even 300 looked difficult.